The Fitness Reality 1000 plus Bluetooth Magnetic Rower is an affordable entry level rower that is integrated with features that allow you to perform additional exercises such as Front Raises, Tricep Extensions, Side Raises, Curls, Reverse Grip Curl, upright rows, bent over rows, standing shoulder presses and more. The strength training is not part of the traditional rowing exercise. This is a kind of innovation that makes the rower standout from the rest on its category. It has got a manual magnetic resistance system with 14 levels, suitable for beginners, intermediaries and everyone else that wishes to lose weight, tone the muscles and improve the overall physical well being. That said, the resistance does not provide extremely challenging workouts that are difficult enough to impress the pro athletes because it is not dynamic as some of the air or water rowers. The rower has a Bluetooth Smart Fitness with free MyCloudFitness app that allows you to track workout results. You should be able to choose between 3 workouts goal settings that include time, distance, and calories burned via the app. The fitness app is available and compatible with Android and iOS smartphones. The LCD monitor also keeps you motivated and focused by displaying workout data such as the time, distance, total count, calories burned, strokes/min and scan. The rower is sturdily built to support 250 pounds/113 kg maximum user weight capacity with a good base framework that guarantees good stability. The seat travels 39 inches, therefore users between the heights of 4’9’’-6’6’’ tall can be accommodated. Click right here to have a peek at the discounted price of the Fitness Reality 1000 plus Bluetooth Magnetic Rower on Amazon. The Fitness Reality 1000 plus Bluetooth Magnetic Rower with Free App and Front Stabilizer Foot Pads is a low impact full body rower that engages muscle groups such as the forearms, biceps, triceps, shoulders, legs, thighs, and more. The frame is made up of steel that is coated with anti-corrosive paint that preserves its quality from being degraded by rusts, while the resistance/drive system’s shroud is made up of an ABS plastic material. The rower is designed to support users with a maximum weight of 250 pounds/113 kg. It is integrated with solid front and rear bars that guarantee stability. The rear stabilizer bar has adjustable levelers that enable the user to balance the rower on a surface that is not even while the front stabilizer bar is integrated with the foot pads for additional strength training as aforementioned. It weighs about 63.6 pounds/29 kg, which is not very heavy, however, it boosts the overall stability. The overall assembled dimensions of the rower are 88.5 inches long by 21.5 inches wide by 21.5 inches tall. Differently put, the rower will require a workout area with dimensions of 7’3’’ long by 1’8’’ wide, plus additional 1’-2’ at the rear and on each side of it for safe and convenient workout executions especially if it is going to be used in a confined area. It has a space-saving design that allows it to be folded up when it is not in use. The folded dimensions are 39.5 inches long by 21.5 inches wide by 53.5 inches tall. This means the rower’s length is reduced to more than half its assembled size when folded which ultimately makes storage easy and convenient. It is also equipped with transport wheels that make it portable. It has a slanted 39 inches rail that is 9.5 inches high at the lower part and 12 inches high at the top end. Every user, including those with a disability, can easily get on & off of the rower without hassle. 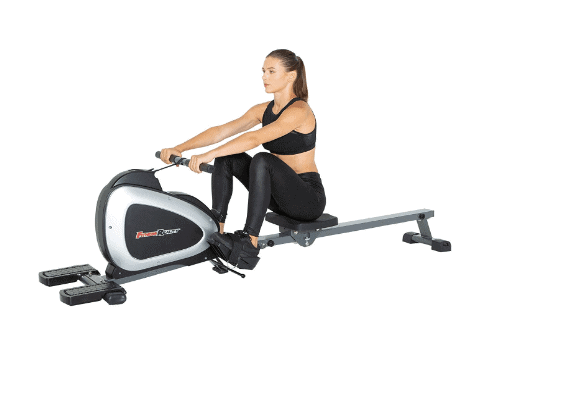 The Fitness Reality 1000 plus Bluetooth Magnetic Rower is equipped with a large contoured padded seat with dimensions of 13.5 inches long by 11 inches wide. It is designed to provide the optimum conform that endures through long rowing session and the user won’t experience slipping off of the seat while rowing. The seat is integrated durable concealed ball-bearing rollers that ensure smooth and quiet rowing strokes are achieved. The 21.5 inches extra wide handlebar is coated with soft rubber foam for secure and comfortable grips for different workout exercises. This means that your grips will always be secure and there will be no blisters in the palms and neither will you experience slippage as a result of sweaty hands. The handlebar is anchored to a 1-inch nylon strap that is attached to the drive/resistance system. The nylon strap won’t break or snap during workouts no matter the intensity. The pedals are large with adjustable safety straps that secure the feet in place. They also pivot to provide a suitable angle for the feet which eliminates or reduces ankle stress. They have borders that secure the heel from slipping down and they accommodate standard gym shoes and users with different feet sizes. The Fitness Reality 1000 plus Bluetooth Magnetic Rower is integrated with manual magnetic resistance system that offers 14 adjustable levels. The magnetic resistance system has always being popular because of its smooth and quiet operation. The resistance system generates almost zero noise during operation and this allows users to be able to do certain things they would love to do. They will be able to train at any time of the day without the concern that the family or the neighbors would be disturbed. They would be able to watch their favorite TV show or listen to good music without any noise interference. 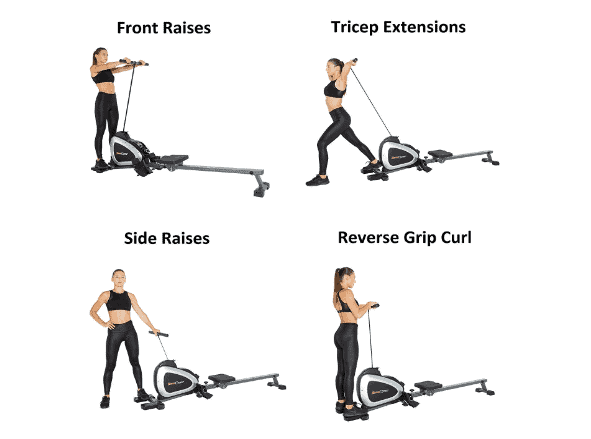 When it comes to the resistance difficulty level, this has a 14-level dual transmission that allows the user to experience decent easy to difficult workouts. Everyone at any fitness level would find the resistance useful, especially beginners, intermediaries and those that wish to keep up with good physical fitness. However, if you are expecting extremely challenging workouts then this might not be the right choice. You may have to look up dynamic water or air resistance rowing machine such as the Concept2 Model E or the WaterRower Natural Rowing Machine Ash Wood S4 Monitor. The resistance system is also maintenance free. In other words, it doesn’t require any serious maintenance of lubrication, adjustment or having to change a worn out part. It is basically user-friendly. The resistance adjustment is done via the tension knob. You can easily increase the resistance by turning the tension knob clockwise or anticlockwise to decrease it. It is as simple as that. The rowing machine comes with a console that features a 3.5 inches LCD display monitor. This monitor tracks workout data such as time, distance, total count, calories burned, and strokes/min which ultimately keeps the user motivated and focused. By default, the monitor uses the SCAN function to display all the workout data one at a time after a few seconds, rotationally and continuously. However, you can decide to set up a certain workout data of your choice to display constantly without changing to another. Its display clarity is good so long it is being viewed in a room that is well illuminated because it is not backlit. 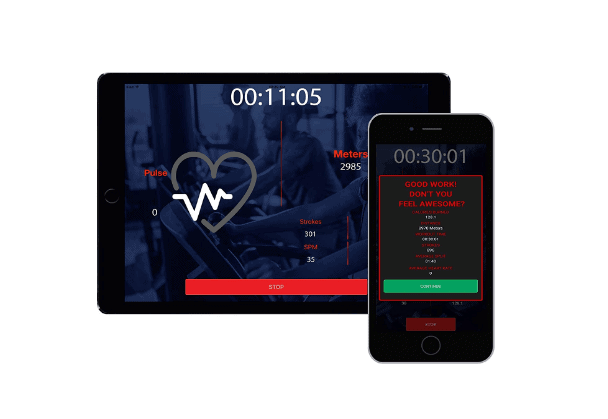 Moreover, the console is Bluetooth enabled which allows you to connect to the free MyCloudFitness app that is available on Android and Ios Smartphone for tracking your workout results. For instance, you can set a workout target goal for time, distance and calories burned and watch any of them being achieved via your smartphone. The console is also integrated with a smartphone holder. The monitor is powered by 4 AA batteries which are included in the package. 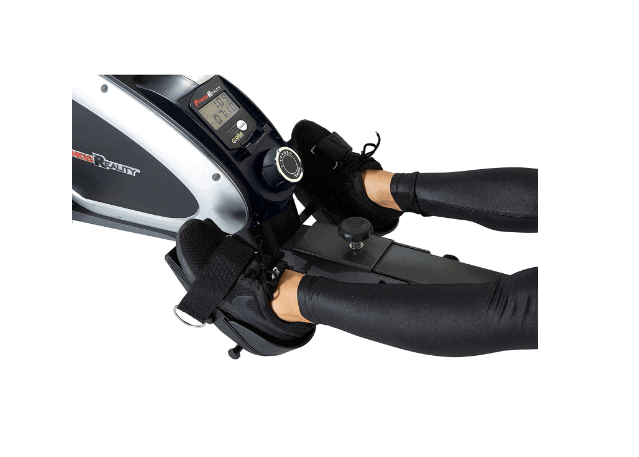 The Fitness Reality 1000 plus Bluetooth Magnetic Rower has a built-in smartphone holder. This is something that is not common with rowing machines because they hardly come with any accessory. The smartphone holder helps you to view your phone while using the free MyCloudFitness app. It doesn’t have a water bottle holder but you can always improvise a means to keep water within reach for hydration during a workout session. The rower is easy to store because of its space-saving design and the integrated transport wheels that make it portable. It could easily be folded up to less than half its length size (folded dimensions are 39.5’’ long by 21.5 inches wide by 53.5’’ tall) when it is not in use. Its transport wheels allow you to easily roll it away to the storage area. At the time of this review, the Fitness Reality 1000 plus Bluetooth Magnetic Rower is pretty popular because the approval rating on Amazon is impressive and good. The Fitness Reality 1000 plus Bluetooth Magnetic Rower is shipped in a box that weighs 77.8 pounds/35 kg with dimensions of 51.2 inches long by 25.6 inches wide by 9.6 inches tall. Vendors such as Amazon provide free shipping and deliver the product within days of order. The assembly of the Fitness Reality 1000 Plus Rower is not really difficult because the difficult part has been done already by the manufacturer. The instruction manual is spot on and simple to understand. The tools required for the assembly are also included in the package. It will take about 30 to 45 minutes to completely assemble it if you are not interrupted by something else. The maintenance of the Fitness Reality 1000 plus Bluetooth Magnetic Rower is not complicated because it doesn’t really need one. You simply have to keep the rower clean at all times and also endeavor to examine it before use for any loose or broken part so as to avoid an accident or further damage to it. Re-tight and replace any part if necessary. The Fitness Reality 1000 plus Bluetooth Magnetic Rower is an affordable rower that offers the opportunity to experience outstanding and productive workouts that could lose weight and improve the overall physical fitness of the user. Its added front foot pads allow you to also perform some strength trainings that could largely tone the muscle groups and improve your strength level.